Someone commented that as a blogger she was inspired to complete projects in order to have things to post on her blog and was looking forward to seeing my completed projects. She may be disappointed. I actually get very little done and I don’t think that blogging is going to help me much in that department. My blog goal is to write enjoyable and informational blogs; posting completed projects isn’t why I started this, but maybe blogging will spur me to get more done. I completed and mailed a couple of Valentine’s fiber postcards this week, but I forgot to even take pictures of them. I also worked on other Valentine’s projects. I bought the candy with the words on them. The candy was really poor quality and looked nothing like the pictures on the front of the bags, but after buying two bags, I was able to sift out some fairly decent pieces. I didn’t send any of these out this year, but I’ll be ready for next year. 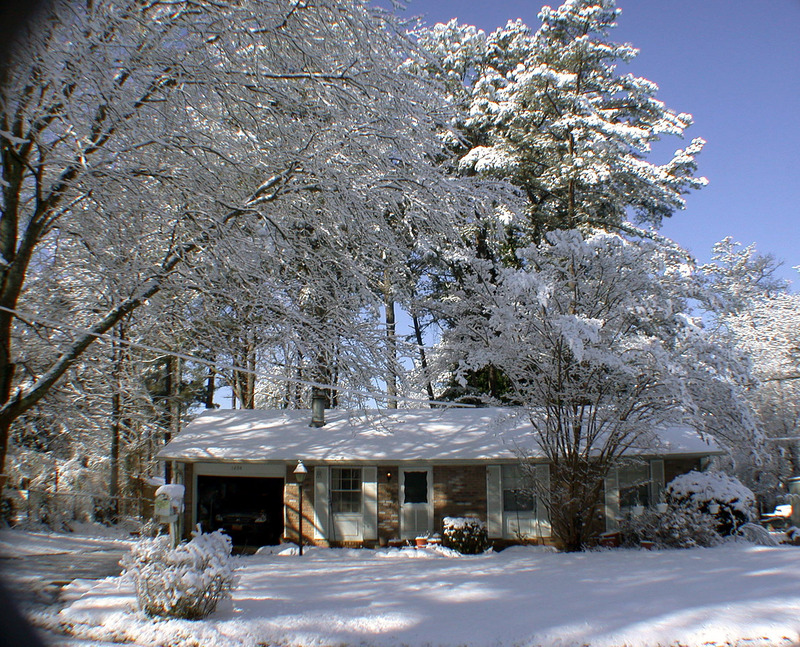 Well, we had one of those rare snow days here in Atlanta this weekend; I took pictures of my house and the street winter wonderland scene. I have little gazebo bird feeders hanging from shepard’s hooks in front of the front windows but those pesky squirrels are forever getting in them and break the hooks off the feeders. 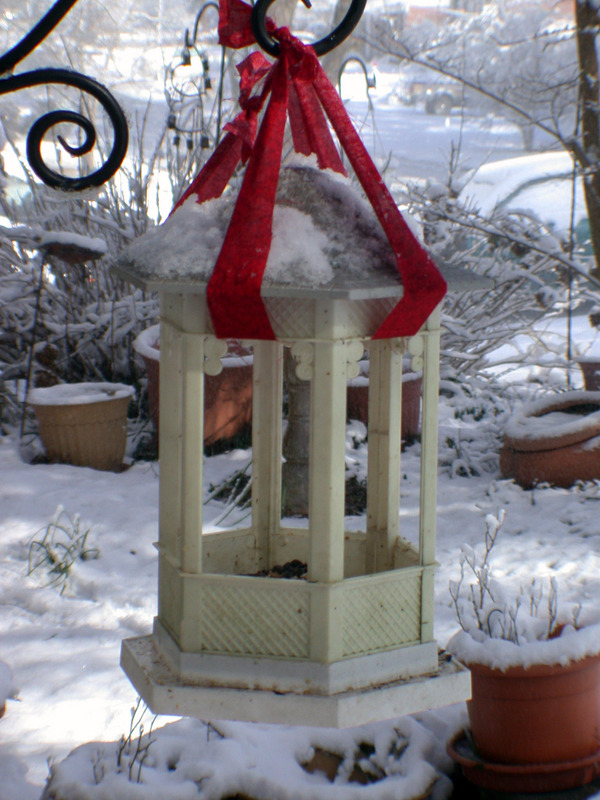 I wanted to make sure the little chickadees could find some food this snowy weekend, so I devised a quick fix using left over fabric to re-hang the feeders. What’s that they say about necessity and invention…? 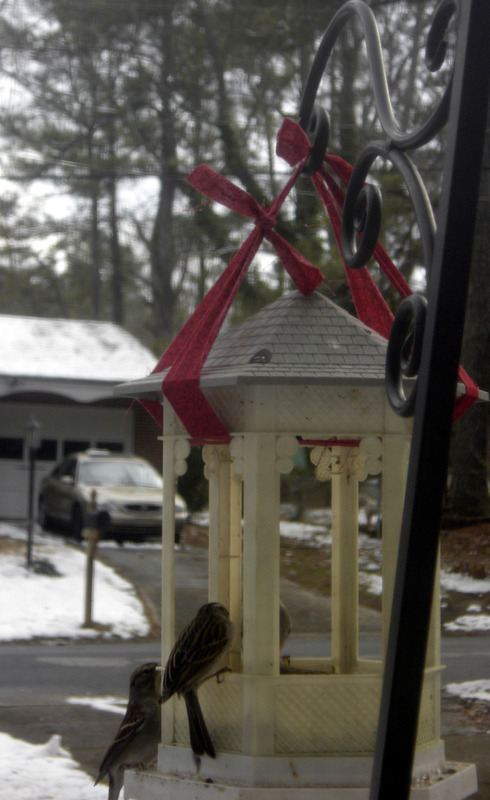 My cats and I both like seeing the birds get the goodies from our own perch inside the house and I think the birdies probably appreciate the re-installation of the broken feeders with all the snow on the ground. I would love to be able to say I have a wonderfully organized and clean sewing room-but I don’t. I do have some neat things that I use to store and organize that I will show you from time to time. 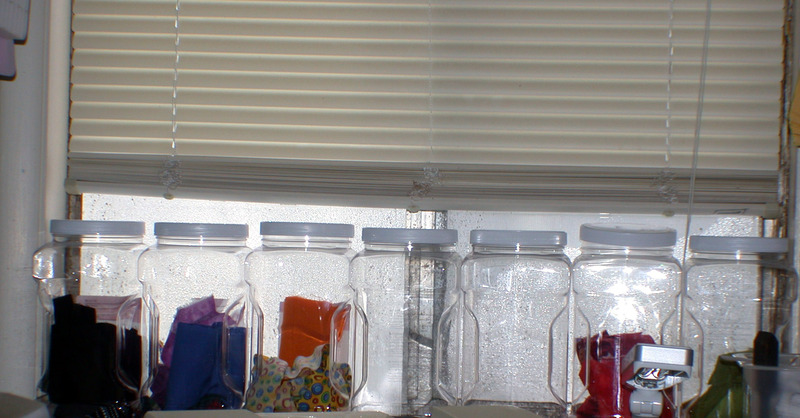 Here’s two: I recently started putting scraps by colors in jars that I keep in the window and in an effort to do my part for recycling, I cut holes in plastic tubs and throw threads in them for later use in projects. I keep one of these by every machine. 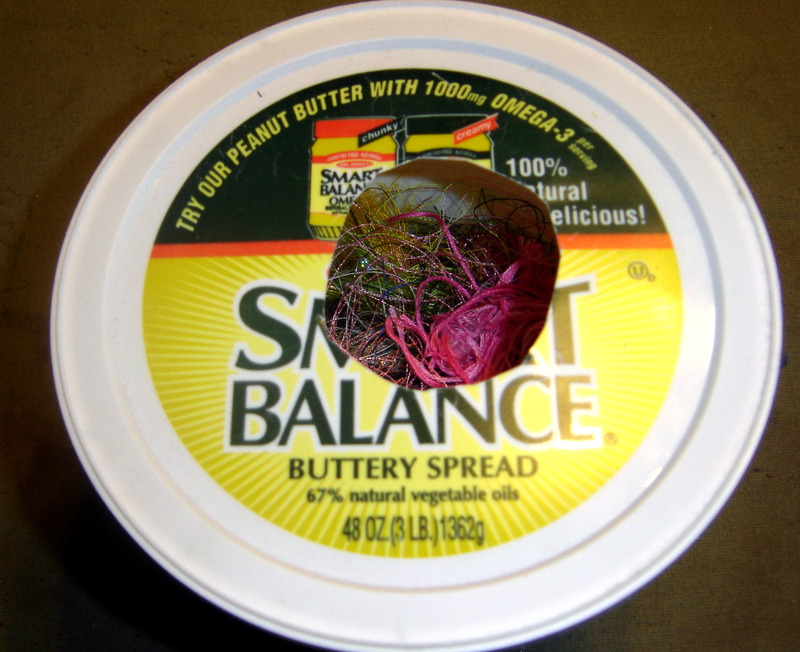 I throw Angelina scraps in these too. Hope everyone had a great Valentine’s Day. I’m currently working on banners for St. Patrick’s Day and Easter to send to a friend’s kids. I’ll post pictures when and if I finish them. Have a good week!